Update: President Trump has signed the deal. Without more Republicans in Congress, we were forced to increase spending on things we do not like or want in order to finally, after many years of depletion, take care of our Military. Sadly, we needed some Dem votes for passage. Must elect more Republicans in 2018 Election! Costs on non-military lines will never come down if we do not elect more Republicans in the 2018 Election, and beyond. This Bill is a BIG VICTORY for our Military, but much waste in order to get Dem votes. Fortunately, DACA not included in this Bill, negotiations to start now! Update: The House has passed the budget measure, 240-186. House Speaker Paul Ryan called the deal's passage a "great victory" for the military. "This is a great victory for our men and women in uniform," he tweeted along with a statement. "We ultimately reached a bipartisan compromise that fully funds our troops and gives our generals the certainty they need to plan for the future." The Senate passed a $400 billion budget deal early Friday morning, hours after missing a deadline to avoid a shutdown—the second in three weeks. Sen. Rand Paul held up the deal Thursday over the increased debt the deal would lead to. After Paul’s delay the measure was easily passed, 71-28. It was then sent to the House to be taken up immediately, although passage there is not a guarantee. Democrats oppose the measure because it does not a permanent fix on DACA and are demanding a commitment from House Speaker Paul Ryan that he bring immigration legislation sponsored by Reps. Will Hurd, R-Texas, and Pete Aguilar, D-Calif., up for a vote. Fiscal conservatives meanwhile are opposed to the amount spent on Democratic priorities and a return of more than $1 trillion deficits next year. The underlying bill includes huge spending increases sought by Republicans for the Pentagon along with a big boost demanded by Democrats for domestic agencies. 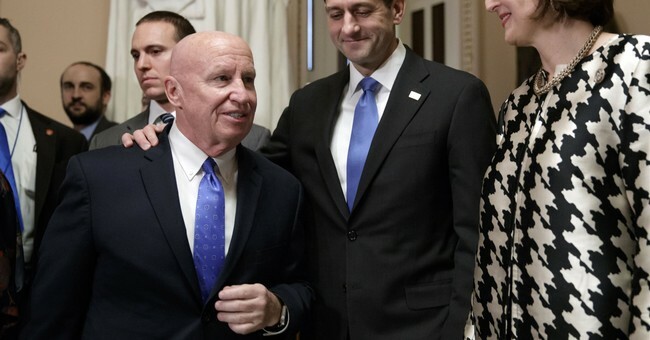 Both sides pressed for $89 billion for disaster relief, extending a host of health care provisions, and extending a slew of smaller tax breaks. It also would increase the government’s debt cap, preventing a first-ever default on U.S. obligations that looms in just a few weeks. Such debt limit votes are usually enormous headaches for GOP leaders, but the increase means another vote won’t occur before March 2019. House leaders hustled to move before federal employees were due back at work, hoping to minimize the disruption. A shutdown essentially cuts the federal workforce in half, with those dubbed non-essential not allowed to work. Military and essential workers would remain on the job regardless. Voting in the House is currently underway. On passage of the budget pkg, Republicans have come close to maxing out their yeas for the bill. GOPers need lots of Dems to make up the difference from their defections. This could get interesting.